Filmora Scrn is more than just a recorder and it has more. There are a ton of videos on YouTube and other video sharing platforms that are essentially scenes captured gameplay videos from Android devices. As mobile games get more in depth and high quality, the demand for game capture footage from these games becomes higher. If you're ready to start sharing your gameplay footage from a mobile game on Android, consider the following game recorders for Android. 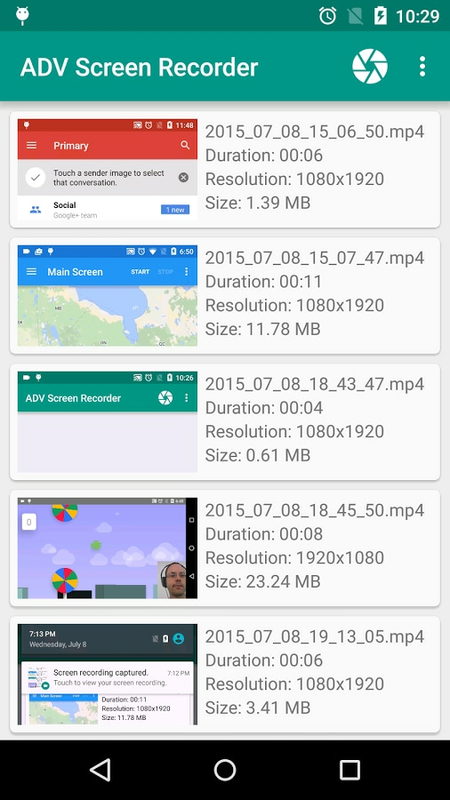 If you have Android Lollipop or higher, you might consider using AZ Screen Recorder. This free app lets you record high quality gameplay on your Android device without overlaying a watermark. It lets you record your screen to HD and FullHD videos and it is the only screencast app in the Android market that can be paused and resumed while recording. It also allows you to record audio from a microphone and automatically mixes the sound in. It also allows you to overlay video from your front facing camera so your viewers can see your reactions to epic gameplay moments. This app also has an editing feature that allows you to trim videos and draw on your recording for the creation of helpful tutorials. ADV Screen Recorder is a fully featured screen recording device for Android with no restrictions. You can overlay drawings or text on the fly, and show your reactions to gameplay using the front or back facing cameras. Using the advanced engine you can pause recording very easily. ADV is easy to use and doesn't require the use of a menu that covers your entire screen. Mobizen claims that this is the easiest to use, most convenient screen recorder totally free on Android. With full HD recording, 1080p resolution at 60 frames per second, you will be recording videos that will be a visual pleasure to all of your viewers. One of the best parts of this app is that all features are available at no cost. You can record your screen, capture, edit your videos, and have a resulting high quality video with no watermark. Mobizen allows you to record long, high quality videos on an external SD card. Rec allows you to record high quality videos at custom resolutions, bit rates, and durations without requiring you to root your phone as long as you have Android 5.0 or above. You can record up to one hour of video and audio using the microphone. The interface is easy to understand, and you can shake your device to quickly stop your recording. You can set custom presets with your most used settings, and automatically record screen touches during your gameplay. One Shot Screen Recorder claims to offer quality, stability, and ease of use. Instead of having to swipe down on your notification bar to stop recording, which is required in many screen recording apps, you can simply hit your power button to stop recording and have a video without any extra, undesired footage at the end. This app also works in coordination with YouTube's required settings for upload so you can upload your high quality video instantly without any need for post production. This screen recorder, unfortunately, does overlay a watermark on the video unless you opt for the paid version. The information above was supplied entirely by the developer's description of each app in the Google Play Store. Most of these apps may have embedded in-app purchases. All of these apps are free, but some of them offer both a free version and a premium version with extra features. The highest rated of all of these apps is the AZ Screen Recorder. It has a user friendly interface, is very easy to use, has options for customization, and offers frequent updates. We rate this app at 4.7 stars out of five. Coming in close behind the AZ Screen Recorder is the ADV Screen Recorder. This recorder is also easy to use and has a user friendly interface with customization options, but it falls short on the updates. We rate this app at 4.3 stars. Frequent updates are key as technology continues to evolve. The Rec screen recorder also falls short on updates, and is not quite as accessible as the other apps. We rate this app at 4.2 stars. Finally, at the bottom of the list, the Mobizen Screen Recorder. Coming in a tie for last are the Mobizen Screen Recorder and the One Shot Screen Recorder. With only 4 stars out of five, the Mobizen Screen Recorder and One Shot Screen Recorder lack any customization options. One Shot Screen Recorder is also lacking in frequent updates.